With link spam becoming a menace it is important for everyone, especially those who are not tech savvy, to be educated in basic link safety tips. 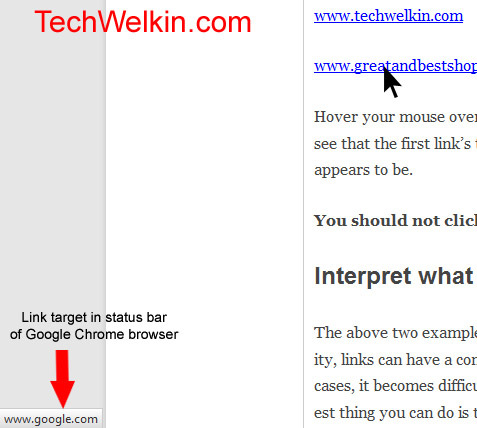 Learn how to easily determine if a web link (URL) is bad without clicking it. Most of the troubles enter in your computer through Internet. I have seen computers of most people infested with all kinds of software which they never intended to install! It includes unwanted search, toolbars, extensions and what not! Mostly these programs get installed because Internet users click on bad links. Now what is a bad link? How can you identify a bad link? I think identifying bad links is important for all Internet users. Let’s learn how to know if you are looking at a bad link, that too without clicking it! Nowadays, we all come across a lot of unsolicited links everywhere on Internet –and not all of these links are equally safe to click. Links posted on websites that have user generated public data are more likely to put a bad link in front of you. For example, links posted on sites like Facebook and forums should be clicked with a pinch of salt. Because of link spam, rampant on social websites, it is important for all of us to learn how to determine whether to click a link or not. I am giving you a few tips that you can use to test the suspicious links. In all modern browsers, when you hover your mouse over a link in a web page –the link’s target address appears in the status bar. Status bar is small area given at the bottom of the browser window. Hover your mouse over both the above links and notice the target addresses in the status bar. You’ll see that the first link’s target is indeed what it claims to be –but the second link’s target is not what it appears to be. You should not click on links that show a mismatched target address in the status bar. The above two examples are simple because they are just for the demonstration purpose. But in reality, links can have a completed structure which many people might find difficult to interpret. In such cases, it becomes difficult to decide whether a link is safe or not. If you encounter such a link, the easiest thing you can do is to look for reliable words in the link address shown in the status bar. If the link claims to be pointing to, lets say, amazon.com, you should looking for the words like amazon or amazon.com in the address shown in the status bar and ignore the “technical stuff” that makes part of the address. If you wish to further know the structure of a web address (called URL), you may want to read our article on understanding the components and structure of a URL. The above methods are not fool-proof methods of ensuring link safety -but these easy ways will help you in avoiding a number of bad links. Please let me know if you have more suggestions. And, as always, feel free to ask any questions that you may have. Thank you for using TechWelkin. You mentioned the link appearing on hovering. Can I test it using Selenium?. If so what HTML tag is used for status bar? Preetham, it’s an too simple tip to warrant the use of Selenium. It’s common knowledge that when you hover mouse over an anchor link, you see the target address in the status bar of browser.